'Benedictine' ( Marky Smith, R. 2012) Seedling #09-18A. BB, 24 (61 cm). Early midseason bloom. 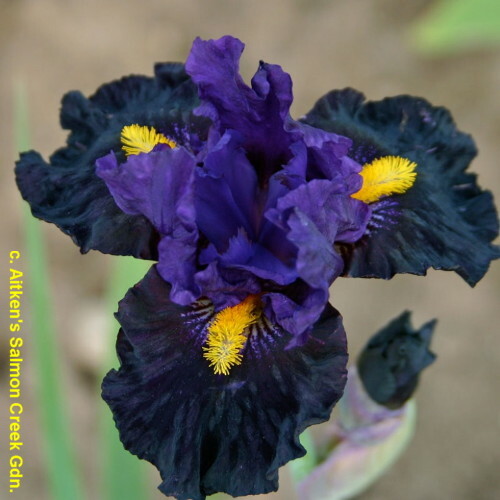 Standards silky dark bishop’s purple (RHS 83A); style arm ribs and crest same as standards, sides greyer; falls velvet black (202A), cream feathers around top 2/3 of beards; beards large, fuzzy yellow-orange (17A); slight spicy fragrance; some ruffles. Seedling #04-38A: ( 'Jump Start' x 'Fiery Temper') X 'Lady of the Night'. Salmon Creek 2015.